Home / Happy 50th Anniversary, Star Trek! Like many people, today I’m celebrating the 50th Anniversary of the premier of Star Trek. I’ve been reflecting lately on why this particular cultural phenomenon has had such a grip on me for so long. I started watching when I was about 11 years old— only two years after Star Trek ended its three-year run on NBC, and long before its many movies and subsequent series were produced. At that young age, something about Star Trek captivated my imagination in a way that few things have. Honestly, apart from my Catholic faith, I can’t imagine any single thing that has so influenced my outlook on life, my thinking, and my hopes and dreams. During this anniversary year many people have documented the influence of Star Trek on our culture. From the design of our mobile phones to the very language we speak (actor Brent Spiner is the reason we commonly say DAY-ta, not DAT-a), Star Trek has been a driving force behind invention, innovation, and cultural shifts, particularly in the area of civil rights. In the 1960s the multicultural crew of the Enterprise simply presumed the equal rights and dignity of all people. And they managed to do it without the dismissive sneering about “political correctness” that such progressive ideas would be met with today. Mostly, Star Trek has been about hope. It maintained a vision of the future that was confident in humanity’s ability to transcend our conflicts, celebrate our diversity, eliminate poverty and disease, and venture forth into the galaxy in a genuine spirit of exploration. Not to exploit resources or conquer other planets, but to increase our knowledge and understanding. The official motto of Starfleet Academy is Ex Astris Scientia: From the stars, knowledge. At a time when virtually all speculative fiction in popular culture is about the end of the world (by natural disasters, zombies, alien invasion, or sharknados), Star Trek projected a future we could believe in, and work toward. And for those of us more deeply involved in Star Trek fandom, that hopeful future isn’t far away. This August I attended the Official 50th Anniversary Star Trek Convention in Las Vegas, a gathering of some 7000 fans, with presentations and panels from more that 100 actors, writers, producers, musicians, and other production artists. Fans traveled from literally all over the world to this gathering. We were people of every shape, color, size, and age, all united in our desire for a hopeful future. I was delighted to see that everyone got along, treated each other with respect, and readily engaged in discussion of Star Trek not just as our favorite entertainment, but as a source of inspiration and hope. I saw women and people of color testify that Nichelle Nichol’s portrayal of Lt. Uhura influenced them to pursue careers in science and engineering. I saw a young man with an autism spectrum disorder explain that Jeri Ryan’s portrayal of Seven of Nine (the human rescued from the cybernetic hybrids, the Borg) helped him in his struggles to understand human communications. I saw hundreds of people in various Starfleet uniforms; not just because it’s fun to dress up, but because those uniforms represent some important ideals for them. I was reminded of my first Star Trek convention, in 1976. I was thrilled to find that all these adults were interested in the same things I was, and were willing to engage in serious conversations, even though I was only 15 years old. At that first convention I attended, while awaiting the start of a panel discussion on the future of robotics and artificial intelligence, I had a fascinating conversation with an older gentlemen sitting next to me. When the panel was introduced, the man stood up and walked on stage. I had been conversing with Isaac Asimov! Last year while meeting with a vocation prospect— I was then the Paulist Fathers’ Vocation Director— I described what I liked about being in a religious community like the Paulists: We are a hierarchically-organized group, drawing on the gifts, talents and abilities of each of our members, pursuing our shared mission, with an essentially optimistic outlook and a recognizable uniform, and with hope for a brighter future. I paused for a moment, and realized that metaphorically-speaking, I’d joined Starfleet! I have three Starfleet uniforms. On the wall of my office are nearly 300 autographed Star Trek game cards. I’ve won national Star Trek trivia contests. I’ve taken a Star Trek cruise. I was responsible for the first liturgical use of the Klingon language in the Catholic Church (long story….). My daily conversation is littered with Star trek quotes that most of my interlocutors don’t notice. Star Trek has brought me some of my deepest and most lasting friendships. It has given me insight into leadership (thank, Jean-Luc Picard!). It has taught me ethics and morals, and helped me believe in the goodness of people, even as we struggle to survive so many crises. 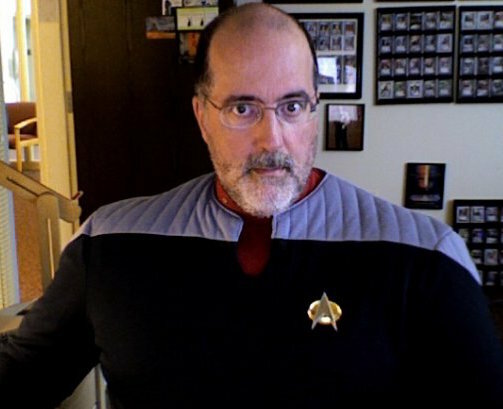 I’m a Trekkie, and on this 50th anniversary I can honestly say I’m proud of that designation.